It's been a reasonably quiet start to the year. Mummy had a weeks holiday so she made the most of it by challenging herself to get as many steps as possible registered on her 'Fitbit', as well as going out on a bike ride with Daddy and Euan. Daddy had his annual CPD training on the 15th January - he feels he did very well to stay awake for the duration of the training! Euan has been keen to do quite a bit of cooking this month - so far we have had cinnamon bread, jambalya and flatbread. We had another trip down to Berwick to see Auntie Gillian and take her out for lunch at the Castle Hotel. Despite February being the shortest month there were plenty things going on! We headed off to Knockhill Racing Circuit one wintery Sunday to watch the Grant Construction Rally. Euan had managed to forget his jacket so we had to wrap him up in Daddy's work coat. The rally was very exciting, with cars slithering about all over the place in the snowy conditions. Great fun, but it took the whole journey back to Errol before Mummy's feet had defrosted! Valentine's Day was a bit of a non-event in the Steven household - we did may some melting heart cupcakes to celebrate. Thankfully they tasted much better than they looked! Euan was off school for half term so we took the opportunity to do some travelling. On the Wednesday we popped up to Aberdeen to see Auntie Jennifer, then on the Thursday we headed down to Edinburgh, We stayed in a lovely apartmentin Leith and had a wonderful dinner at Mum's Restaurant ... Euan even managed pudding. Mummy and Daddy were completely stuffed and struggled to finish the wine. On the Friday we headed south for forenoon tea at Merryhatton Garden Centre before heading to the Museum of Flight. We were entertained by Auntie Margaret's little video clip about the air ambulance. Euan was amazed at Concorde. Following on from this we continued on the the youth hostel at Berwick. On the Saturday morning we collected Auntie Gillian and headed off for a day exploring north Northumberland, rounding it off with dinner and a drink at the Percy Arms in Chatton. The weeks are going past so quickly that we never quite managed to get the blog for March done...so here is March and April combined! As always the beginning of March starts with World Book Day. This year Euan chose to dress up as Tim Diamond, Private Detective from an Anthony Horowitz novel, complete with shirt, tie, dark glasses and spy pen! Mummy thought that he looked a bit like a trainee funeral director. School parents night was on the 8th March. Euan continues to make excellent progress. Other school events in March were a visit by author, Maz Evans. Euan was delighted with the signed copy of her book, 'Who Let the Gods Out'. Euan's class had a trip to Perth museum to see their Mummy as part of the Egyptian project, in addition to performing a play about the Egyptian's. Euan's role was 'fact reader'! Euan also had to be at school early (8.00am) to help set up the iBike Breakfast. Thankfully he didn't eat it all before the participants arrived. Euan had an overnight stay at the farm in the middle of March to allow Mummy to travel down to Yorkshire to celebrate her friend Colette's 50th birthday. Afternoon tea at Betty's in Harrogate was delicious! We had a visit from Auntie Margaret and Uncle Richard the first weekend in April. Euan was very adept at giving them a guided tour of the Farmers Market in Perth and showing them the sights of Errol! The first Monday of the school holidays involved Daddy daycare. Both survived!! Euan then had a few days at holiday club beofre going on a 'play date' to Hannah's house. He had an absolute ball! Baking, cycling, chatting,etc... Hopefully we will be able to reciprocate in the summer holidays. Mummy was on annual leave on the second week of the school holidays, so Euan and her had a day trip to Edinburgh. A successful visit to the National Museum of Scotland and an equally successful return visit to MUM'S Cafe for sausage and mash lunch. Mummy had also arranged for Euan to take part in an outdoor adventure day organised by Perth Leisure. He had a great time building shelters, bouldering, abseiling and drinking pine needle tea! On Good Friday we all headed off to Aviemore for a few nights camping. It was very chilly but mostly dry. We managed a good bike ride deep into the Rothiemuchas Estate. Mummy was very grateful for her new bicycle - it made life a great deal easier. We stopped for lunch beside a fast flowing mountain stream - none of us fancied wading through to continue along the track - just as well as it had started snowing by that point! As Mummy had to be back to work on Easter Monday, Daddy and Euan waved bye bye to her on the train on Sunday afternoon so that they could stay and have more adventures ...this included Euan completing the 'Tree Zone' high ropes course and the pair of them eating their fill at the Italian Buffet! We managed to fit in a visit to the farm at the end of the month, following a rugby tournament at Stirling. Mummy and Euan were lucky enough to feed some of the new lambs at the farm - they were very noisy. We also managed to fit in a trip to the Links Market (thank you Uncle Brodie) Euan enjoyed most of it but was feeling a little 'under the weather' after being on the waltzers and rotor in quick succession!! Meanwhile rugby and swimming for Euan is all going well. He has played in a few matches and seems to be enjoying the training at the moment. His good attitude and team spirit earned him the 'Player of the Week' trophy after one particularly good session. Lots of exciting things happened in May! Euan and Daddy did an overnight camping trip in Aberfeldy followed by a 10 mile paddle down the Tay (finding various paddles on route!) They both had a great time and were starving and exhausted when they arrived back in Errol. Just as well Mummy had a scrummy tea prepared for them! There have been lots of school activities in May. Euan had two weeks of swimming lessons through school- this must have been beneficial as he's passed level 6 in the swimming scheme. This also means that swimming night is now on a Monday - a change to the routine!! Euan's class were also involved in the new clay building being erected in the park - We will post some photos when it is finished. Euan also had a star award at assembly for his excellent reading in class as well as a special certificate from his class teacher for outstanding homework. The big event this month was Uncle Brodie's 60th birthday! Auntie Rosemary did a wonderful job of organising the 'surprise' party. It was fantastic fun with guests from near and far attending! We had a family outing to the Ingliston Revival - a celebration of classic motor racing. Many wonderful cars to look at! Mummy particularly enjoyed the vintage funfair which was also there. Euan was somewhat embarrassed by this! Rugby highlight for this month was the Perthshire home tournament. The weather was fantastic and both Perth teams did really well, getting through to the semi finals. Lot's of weekend activities in June! Peter and Flora are back from Thailand for a little while so we caught up with them, and Auntie Gillian in North Berwick on a very warm weekend. We had a lovely Italian meal on the Saturday night and we all loved the desserts!! On the Sunday, Auntie Gillian came with us to the Museum of Flight - she loved seeing Concorde! The following weekend we paid a visit to the Royal Highland Show. Auntie Margaret accompanied us and we had a super time watching the horse shoeing competition as well as seeing loads of animals. As ever, Euan particularly enjoyed the food hall and was given a discount by one stallholder in honour of his good manners! We're not quite sure where the summer holidays went so the update for July and August have been combined! Euan started off his summer holidays with a impromtu sleepover at a friends house. He was very excited by this - Mummy and Daddy relished the peace and quiet at home! For the first three weeks of the school holidays, Errol went to the Errol Childrens Club. His favourite activity was the cafe, where he was able to use his charm on real customers! At the weekends in July, the tent came out and a couple of camping trips took place. The first of these was just Daddy and Euan up near Aviemore, when Euan tried sailing for the first time. Good fun was had! The second camping trip was a family affair in Comrie. A lovely little campsite - despite the rain. We managed a reasonable bike ride (although I dispute the description of 'easy'), taking in the sights of Cultybraggan camp and the Earthquake House en route. The fourth week marked the start of Mummy's holidays. After arriving back from Comrie, we popped into Perth to meet Mummy's friend Margaret for a picnic in the park. It was quite sunny and we all ended up quite pink! On Tuesday we travelled into Dundee to meet up with Auntie Jennifer. We had a lovely time looking round the Verdant Mill museum with her. Wednesday was another damp day, but Mummy and Euan braved the weather and headed to the Engine Shed in Stirling to discover more about Scottish buildings and the materials used to construct them, Euan tried his hand at some stone masonary - it was hard work. On the Friday, Rosie came up from Edinburgh for a visit. After a leisurely wander round the shops, Euan insisted that we went to Duo, his favourite pizza restaurant for lunch. Very tasty! At the end of the month we headed off to Orkney for a week in the Slap! 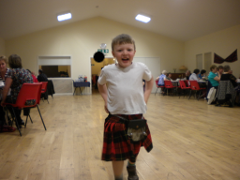 As you can see from the seperate 'Orkney Diaries' page, we had an absolute ball! Very sadly on the 11th August, Grandad Pedro passed away after a short illness. We will miss our Sunday morning chats on Skype. On the 20th August, Mummy celebrated her half century. Any plans to allow this to pass quietly were thwarted by friends, family and work colleagues being involved in a surprise ceilidh. After the initial shock, Mummy recovered and had a wonderful evening! The cards, good wishes and wonderful gifts was quite overwhelming - so a huge thanks to everyone involved! Euan is back at school and now in Primary 6. His teacher this year is Ms Harrison. Euan likes her because she keeps the class from making too much noise. Euan is also delighted that his friend Shan is now at Errol Primary. We are finally back into the routine of work and school in September. Euan seems to be enjoying being in P6 but there appears to be more homework in this class! At the start of September, Mummy paid a visit to the Dundee Flower and Food festival with a friend from work. No entries submitted this year but Mummy's previous boss won the famous Scotch Broth competition. Euan has changed squads in rugby and is thoroughly enjoying being with his new team mates. Lots of training and encouragement although the fitness training at home isn't going so well. Maybe his parent's need to be challenging him on the circuit training!! September marks the time for the annual Open Doors event in Dundee and Perth. This year Mummy and Euan visited a couple of churches in Dundee, the PDSA, Ninewells Community Garden, Maggies Centre and the Jacqui Wood Research Centre. The herbalist at the garden helped us chose some aromatic leaves to make into an infusion. Euan drank it but I think he plans to stick to milk as his favourite tipple! At the research centre, Euan learned quite a lot about DNA and cell division before getting the opportunity to do some lab work! For the Perth Doors Open event, Daddy and Euan were given the opportunity to find out more about the huge road construction site on the outskirts of the city. Both really enjoyed it and Euan won a prize for building the tallest tower from spaghetti and marshmallows! Towards the end of the month, Mummy had arranged to meet friends in St Andrews for afternoon tea - Daddy and Euan came along later to play in the sea before giving Mummy a lift back home! October started with a trip to Kinross for a rugby tournament - that's another medal for the trophy cabinet. Euan has completed all his swimming lessons and started going along to Cubs at St Madoes, just to keep Mummy busy in the evenings!. We finished the month with Uncle Brodie and Aunty Rosemary coming for dinner, Game casserole, very tasty according to Euan. The month started with Euan being a ball boy for Perthshire first 15 rugby, he picke dthe best job, dressed up as the mascot. This must have inspired him because the next day at St Andrews he played some his best rugby. The coaches noted this! Unfortunately that was the last of the rugby for the month - games cancelled due to frozen pitches. We also had a weekend away in Aberdeen in November. We managed to go an visit Auntie Jennifer and Uncle John - Euan managed to cope with a rather boisterous Kip, the dog! Whilst Mummy spent the day cooking, eating and drinking wine at the Nick Nairn Cook School, Daddy and Euan went off to explore the sights of Aberdeen. The maritime museum was a great hit! We met up again later in the afternoon at the cinema to see Paddington 2 - it was wonderful! Christmas fayre time - a good time was had by Euan and Wendy at the fair. Last rugby session of the year for Euan was at Cupar, a good performance all round, especially asit was very cold. The following weekend was our shopping trip to Aberdeen. We left Wendy shopping while we visited the science centre. We then met up at Nick Nairn's cafe for pizza before driving home. Daddy took Euan to Olympia for a swim and play on the flumes, followed by hot chocolate at home. Meanwhile Daddy walked to a bothy, as reconnaissance for a trip with Euan. He also managed to pop down to Berwick to see Gillian and then get home to shampoo the carpets.